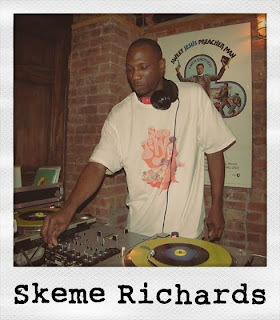 Props to DJ PRESTIGE over at FLEAMARKETFUNK for his recent interview with ROCK STEADY CREW deck technician and lover of all things funky SKEME RICHARDS. SKEME is always hard at work diggin' for 45s, watching old kung fu flicks, and chasing down that original boxed toy from the 70s. If not doing that he is travelling the globe rocking parties and providing beats for the b-boys & b-girls, so PRESTIGE did well to get more than five minutes with the man himself. Check it out over at FLEAMARKETFUNK, and if you are not already a regular on this site then I suggest you have a read through his vinyl delights while you are over there. I'm sure you will enjoy every minute of it. Big shout to PRESTIGE and SKEME. Thanks for the post cousin! Hope all is good on your side of the globe. Hope to see you guys in a few months.